Put those warm tone shades of dog sweaters on your furry friends with love and style this season! Those 2 sweaters would let your dog step into warmth and coziness during harsh winter walks. At Blueberry Pet, we totally agree that our furry friends just need the extra care and warmth during certain season like late fall and winter time. 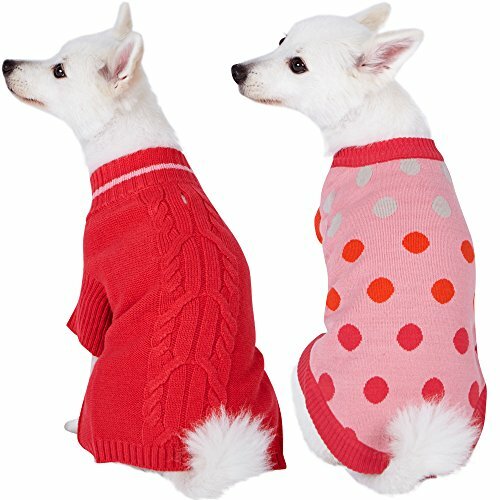 Let's start with the polka dot sweater: every lovely gal pups should have polka dot items in the wardrobe especially when the sweater is in the cute rosy pink and eye-catching orange colors. You simply can't miss this. The second one is a pink cable knit timeless piece, which is definitely an everyday item that your royal friends could wear. Buying this value pack means you would get more options for the most active member in your family! The canine friends are all set to go! Pack of 2; Back Length 8", Chest Girth 8"- 10", Neck 8"; Measure your dog from the base of the neck to the base of the tail for back length. Each value pack contains the same size for both of the two sweaters. The leash/harness hole is smartly designed to make it easy for outdoor activities.